These seem like very nice quality bath mats. Time will tell how they hold up with repeated us. They are very attractive and seem like a nice weight. Bring the simple luxury of a spa into your home with this beautiful set of Salbakos bath mats. Each 20-inch x 32-inch mat is crafted from a twisted Turkish cotton blend for a soft and absorbent surface that is perfect as you step out of the shower. 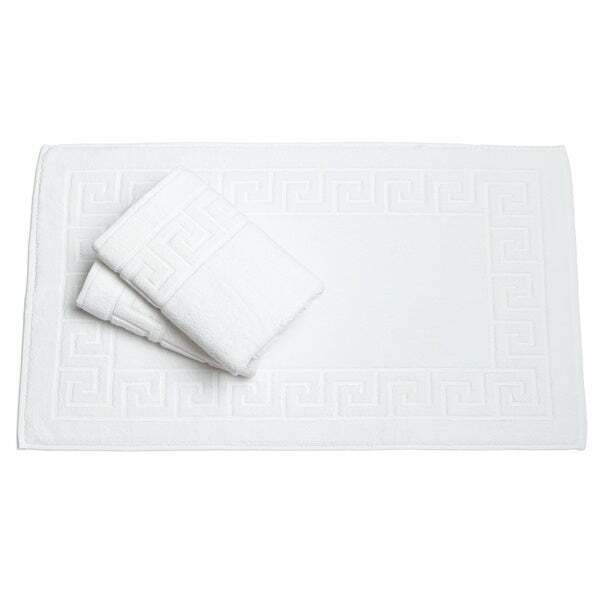 The crisp white, towel-style mats feature an elegant jacquard Greek key pattern border that completes the sophisticated appeal of this lovely set. I love these white bath mats. Quality is excellent (just like you would get from hotels). Stitching and finishing was excellent and very little lint after washing. In particular I love the Greek key design around the edge as they give these mats a contemporary edge over plain ones. I do not understand an earlier review however saying these were used for hand towels. They are bath mats made of toweling material and even though the looping isn't long it dense and highly absorb-able. I much prefer a bath mat than can be washed regularly and dried quickly than one that is very thick (with backing etc) but can't be washed often or takes forever to dry out. If you are looking for the latter then perhaps a bath rug is a better choice, but these are definitely bath mats. As I have a large family I needed durability and have been impressed with the Arsenal towels from Salbakos so was very pleased to see they did the mats as well. I have had my towels for a couple of months and they have held up perfectly. The kids love them and they dry quickly which was really important to me. I am also very happy that Overstock ships overseas, as I am a big fan of Turkish cotton. These are high-quality, attractive bath mats. They're soft underfoot and absorbent, but they dry quickly. I prefer this type of mat to the heavier type of bathmats with rubber non-slip backing that never seem to dry. It just depends what you want. These are lovely and an extraordinarily good value. These bath mats are simple, nice, white terry cloth. They feel thick and luxurious. I am very pleased with this product. Better than I expected. I may order one more set. Good quality. The only thing I don't like is the fact that the ends curl up when I've just taken then out of the dryer. They take a few days to flatten out. These are wonderful bath mats. I ordered 4 sets of the white mats. I have washed them over and over again, they come out just like new every time. This is one of the best mats out there. I like that it’s not heavy and it dries quick and doesn’t make the bathroom stink. They are easy to wash you can just add them to the white towels. I will use this as a towel . it doesn't have enough thickness for a bath mat for me. but very good quality cotton . I use them in my guest bathroom. Very nice towels. They are lasting a long time! These have held up exceptionally well. I've had my set of 3 for a couple of years now and I'm really impressed with their quality. I've taken good care of them - I've used oxidized bleach (in powder form) on them occasionally to keep them a bright white, in addition to sometimes using vinegar to help brighten things and they've held up to all of this - and drying on high - just fine. I'd recommend these to anyone who likes to keep a clean looking bathroom, I doubt you'll be disappointed. You can never go wrong with these Turkish Bath Mats I am looking for more colors. I purchased so many bathroom rugs, but I am really going to just keep a few dozen of these especially for the guest bathroom. Use them all of the time ,still like new! Good quality. Can easily be washed with bath towels. Perfect for our rental property vs something that needs to be washed separately. Great weight and pattern is nice. Look very clean and spa like and needed 3 matching for our new bathroom. "What is GSM? Can these be bleached?" Hello magicfish, GSM means grams per square meter. Yes these can be bleached. Thank you for shopping with us! "Are there 3 bath mats or a bath mat and hand towels??? Very poor copy here." Thank you for your question questions4u. These are 3 bath mat. Please feel free to contact us again with any further questions.